Trouble Ahead for Junior Uranium? As Casey readers know, I've been bullish on uranium for almost eight years now. And despite the fact that uranium has more than tripled, I continue to like it today almost as much as when I was a lone voice in the woods. Although the uranium spot price has risen from US$7.10 per pound (at its absolute bottom) to a current $40.25 - a 467% gain - I believe it has much further to run. According to Cameco, the world's largest uranium producer, global uranium demand is now 175 million pounds a year. Mine supply is only 110 million pounds yearly. This is a gaping shortfall, and insofar that it can take up to a decade for a discovery to turn into production and there are dozens of new nuclear power plants on the drawing boards all over the world, the shortfall will keep prices rising for years to come. The prospects for the metal itself are outstanding, but the best way to play uranium is through the shares of junior exploration companies because they offer leverage and therefore prospects for greater gains. The good ones, anyway. On that note, I have to say that - despite my bullishness - I'm concerned about the ever-growing number of junior uranium companies. Over the past two years, the number of companies looking for uranium has jumped over 700%. At last count, there are now about 145 such explorers. It's hard to arrive at an exact number since many companies only have uranium in their names. And others are actively exploring while still remaining primarily in other areas. This is a testament to how hot uranium is as a commodity. But it is also worrisome: with so many companies competing for the same number of investment dollars, can we as speculators still expect the same sort of gains that we've enjoyed over the past few years? (By that I mean gains like the 1,498% we enjoyed on International Uranium Corp. or the 1,587% our subscribers made on Paladin). Although I usually pay little mind to the short-term fluctuations of the markets, it seems worth investigating whether the junior uranium sector is sagging under the weight of so many new players. 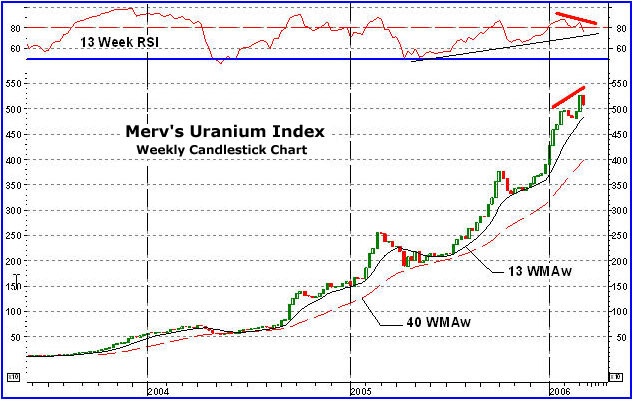 To get an idea, our resident snap technical analyst Merv Burak put together an index of 51 junior companies... all those that have been around for a year or more and that are primarily focused on uranium. The results are somewhat surprising. While the sector did cool somewhat during the last few months of 2005 - following a protracted run that began in July - the beginning of 2006 brought new life to the uraniums. Our index soared nearly 25% in the first two weeks of the year alone. That said, all resource markets were hot during that time. This in itself is not convincing evidence that the sector is still buoyant. Will the sector as a whole enjoy another up-leg of the kind we saw in mid-2005? More important, what's likely to happen over the next couple of years? While it's axiomatic that the higher stocks go, the less upside and the more risk they have, I remain extremely bullish. I suspect uranium is headed to over $100 in the next few years and, even at that level, it will only equal - in constant dollars - its peak in 1980. And the fundamentals now are much stronger than they were then. I'm concerned about the flood of new uranium companies out there, but we're looking at something comparable to what happened during the Internet boom; when the public becomes involved, the top is going to blow off this market. But as yet, the public barely even knows how to spell uranium; and they don't have a clue they can buy shares of companies that explore for it. My guess is that we're not even midway through this bull market, and when we enter the final stage, the chart above will no longer just be a gradual upward curve but a hyperbolic curve. Someplace between now and then I'll be a seller - but at the moment I remain a buyer. The question is: Which stocks to buy? I'm looking to concentrate the junior uranium portfolio for our Casey Energy Speculator on a modest handful of quality companies, the kind that have a real chance of making a discovery and creating value and aren't just relying on hype to move higher. In order for a company to make that list, they'll have to (a) have a management team with serious uranium experience; (b) own a serious property in just the right location; and (c) actually do some drilling to prove they have pounds in the ground (surprisingly, of the dozens of newly minted uranium companies now trading, less than 20 are actually undertaking any serious exploration work). If you like uranium like I like uranium and are looking to leverage your returns through investments in a junior uranium play, do yourself a favor and start getting a lot more selective in what you own. If you fail to do so, not only do you risk missing the next big leg-up, you risk throwing your portfolio into reverse. You don't have to go it on your own! Doug Casey publishes his favorite uranium and other junior energy stocks every month in the Casey Energy Speculator, a monthly newsletter helping subscribers looking to make 100%, 500%, even 1000% profits from early stage energy companies. For a limited time only, you can subscribe for just $79 a year and your subscription comes with a 6-month, 100% money-back guarantee. You take no risk to discover just how profitable the Casey Energy Speculator can be! Learn more now.